Every day this week, Pharmacy Daily is giving one lucky reader the chance to win a Bosisto’s Bedtime Bliss Lavender Pack, courtesy of FGB Natural Products. Stressed? Tired? Sometimes you just need a little help from Mother Nature. Bosisto’s Lavender Spray contains 100% pure premium grade Lavender Oil, so now you can enjoy Lavender’s sleep-inducing, soothing properties at the touch of a button. Each pack is valued at $30 and contains a Lavender Spray, a Lavender Oil and Information Guide. Spray around the bedroom to help sleep or onto a hanky to ease stress and headaches. It’s also perfect to spray in a baby’s nappy bin to eliminate odours. It even helps ease the itch of insect bites! For your chance to win this great prize pack, simply be the first person to send in the correct answer to the daily question below. True or False…Can Bosisto’s Lavender Oil and Spray help to create a blissful night’s sleep? Bosisto’s Lavender Spray can help to ease the itch of what? Which room would you spray with Bosisto’s Lavender to help you drift off to sleep? Spray Bosisto’s Lavender onto a hanky and inhale to ease stress and what? 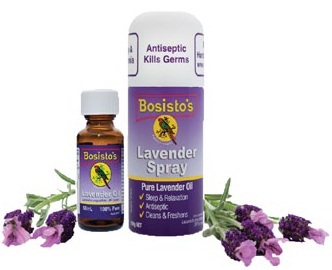 Where is Bosisto’s Lavender Spray perfect for eliminating odours?